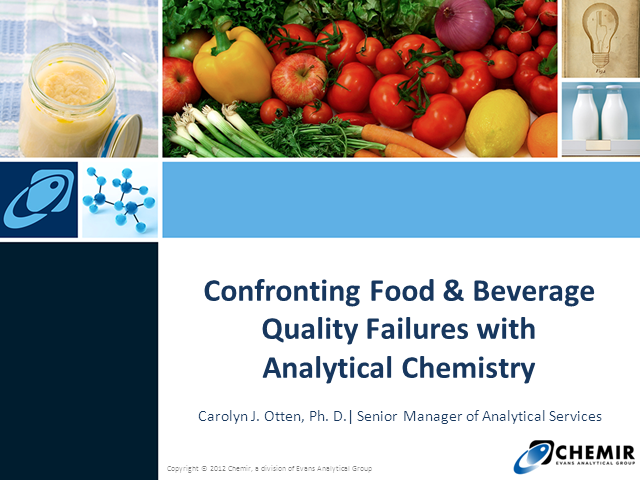 Learn how packaging failures and packaging quality issues are resolved by investigative techniques and analytical chemistry. This webinar features case studies detailing the different analytical approaches and techniques used to solve specific challenges. Join Aaron Cassely of Chemir in this 30 minute presentation of interest to packaging engineers, quality control professionals and lab managers in the packaging, food and plastic industries. Ever want to own brand or product line? Looking for a competitive advantage? From idea to the marketplace, this webinar features case studies detailing the distinct paths to bring a product to market. Join Matt Hubert of Chemir in this 30 minute presentation of interest to entrepreneurs, cosmetic scientists and R&D managers in the home and personal care industry. John Jasper, Ph.D., Albert Lee, Ph.D. Together Chemir Analytical Services and Nature's Fingerprint can provide highly-precise assessment of potential counterfeit pharmaceutical products and, more significantly, protect the highly-valuable process-patent intellectual property of pharmaceutical and biotechnology firms, potentially extending the drug patent life by a number of years. Chemir is an independent testing laboratory, known for its innovative techniques in material characterization. With over 50 years experience in deformulations (reverse engineering) Chemir solved difficult problems for a wide variety of industries. Presented by: Carolyn Otten, Ph.D.